These are sandcastles only in the technical sense; instead of temporary structures erected on the beach, they're images engraved on individual grains of sand, best enjoyed with the help of a microscope. Artist Vik Muniz often plays with medium and scale; he recreated a photograph of Jackson Pollock in chocolate syrup, photographed giant portraits rendered in trash, and carved 500-meter wide pictures in the dirt. For his latest project, however, he decided to think small, creating works that are imperceptible to the naked eye. 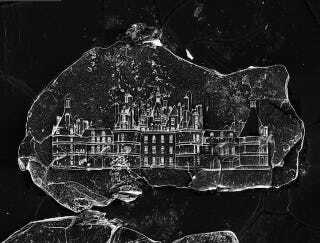 Muniz collaborated with artist and researcher Marcelo Coelho to figure out a way to etch his castle images. Laser etching proved unsuccessful, destroying softer grains of sand and failing to produce sufficiently sharp images on harder grains. Instead, they turned to a Focused Ion Beam for their microscopic engraving. Each pixel in the 640 pixel image above is about 50 nanometers wide. And photographing the images isn't a simple process, since the lines are .4 to 1.0 micrometers, close to diffraction limit of visible light. Head over to the Creators Project blog to see more of Muniz's sandcastles and read more about the project. The blown-up images are on display at the Tel Aviv Museum of Art as part of comprehensive exhibition of Muniz's works.